Ms. Weasley: Very mysterious, indeed! 0.0 i recently finished the book TAngerine in which a sinkhole eats their school. it's way cool. I LOVE KIKI'S INTERESTING BLOGS! WOO-HOO! Eek! That's crazy. Hey, Ananka's lucky that the entrance to Shadow City that first day of adventure wasn't a toxic waste-hole! I'm crawing with bugs and smell like smoke. don't ask why. i found this stuff while wandering around on the internet.. i'm sure most people will agree most of the stuff is pretty nice! Oh, that's really scary! I showed my brother and he said "Is it gonna eat the world?" :) 8 year olds! IT IS GONNA EAT THE WORLD B-BALL-ERINA!! XD I think it'll stop eating Texas soon. I can kinda imagine hundreds or thousands of years later scientists will find "The Ancient Fossel Remainings of a Disaster That Happened Hundreds of Years Ago." Very close to my house, some stones in the street is going down, just as if it was a hole under it. Just a little bit, but still very mysterious! I wanna check it and try to lift up some of the stones to see if I can find something down there. But I have one problem, it's almost always people walking around there and I don't want anybody to see me. And even thought it's close to my house, it isn't the best place to go on your own in night. What am I going to do?? I read Tangerine, too. Yeah, it has a sinkhole. It's a good book, although swallowed up by the sinkhole of mediocrely boring books compared to KIKI STRIKE. Yes. 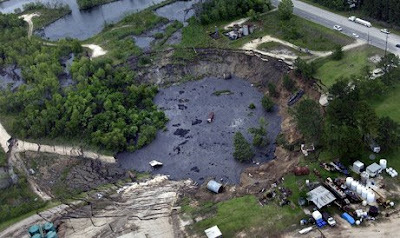 the sinkhole will eat the world. That's cool. I live in Texas! I might check it out next time we're on a road trip! IT'S GONNA EAT THE WORLD!! !